Eye Am will no longer air on Manhattan Neighborhood Network regularly. Instead we are focusing our efforts on further developing the screening series that we curate at Anthology Film Archives. A STEADY GRIND (digital video, 60:00) is a portrait of Eloyse Kereszi, a fiery grandmother with a mouth like a sailor, who runs Joe's Junkyard in Chester, Pennsylvania. Eloyse inherited her husband's 54-year-old business in 1991 when he died of a heart attack on the junkyard soil. He was preparing to have heart surgery, but walked out of the hospital with his IV still attached and went to the junkyard for his final day of work. At this time Eloyse was 60 years old, but retirement was not an option due to thousands of dollars of tax debt, her failing health, and her living son's financial dependence on the business. 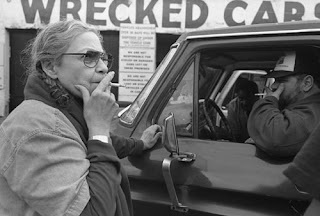 For over a decade, she maintained faith in the family's ability to overcome these hardships, but as she slipped further into tax debt and ill health, Eloyse began to come to terms with the traumatic loss of her husband and sons, and was faced with the decision to sell the junkyard. Eye Am: Women Behind the Lens is a screening series celebrating experimental, memoir, and documentary film by women. Eye Am's current home at Anthology Film Archives in New York City. * If you would like to submit work or host a screening please email vkereszi@earthlink.net. Lengths under 60 minutes are excepted, and there is no entry fee. Su will be present for the screening! Su Friedrich, the feminist film pioneer, will join the New Filmmaker's Series tonight showing a selection of her work that spans four decades. Friedrich's work has inspired both new and experienced filmmakers, and has helped define feminist, queer, and experimental cinema. The film begins with a series of events on a crowded outdoor market street. Women on stages perform “private” rituals: shaving legs and armpits, fixing their hair, etc. A woman tries to disrupt their “work.” She struggles to set herself apart from them, to resist the forces of habit, but gradually becomes more involved than she is willing to admit. Although she sets in motion a chain reaction of rebellion, she isn’t able to keep the momentum going. She stops before carrying it to the logical conclusion, and ends up on the stage herself. An experimental documentary about the filmmaker's mother, who was born and lived in southern Germany from 1920-1950. Through a mixture of personal anecdote and social history, she describes the rise of Nazism, the war years, and the Allied occupation, during which she met her future husband, an American soldier. This films tells the story of a love affair and its demise through one of the objects shared by the couple: an old beige station wagon with fake wood paneling. In Seeing Red, three elements run parallel, overlap, diverge, lock horns and in various other ways give voice to the notion that a color, a melody, or a person has multiple characteristics that cannot be grasped by, or understood within, a simple framework. One element is purely visual. One is very verbal and minimally visual. Su Friedrich began filmmaking in 1978 and has produced and directed eighteen 16mm films and videos, including From the Ground Up (2007), Seeing Red (2005),The Head of a Pin (2004), The Odds of Recovery (2002), Hide and Seek (1996), Rules of the Road (1993), First Comes Love (1991), Sink or Swim (1990), Damned If You Don't (1987), The Ties That Bind (1984), and Gently Down the Stream (1981). Her films have won many awards, including the Grand Prix at the Melbourne Film Festival and Outstanding Documentary at Outfest. Friedrich has received fellowships from the Rockefeller and Guggenheim Foundations as well as numerous grants from the Jerome Foundation, NYFA, NYSCA and ITVS, and in 1995 she received the Cal Arts/Alpert Award. Her work is widely screened in the United States, Canada and Europe and has been the subject of retrospectives at the Museum of Modern Art, the Whitney Museum of American Art, the Rotterdam International Film Festival, The London Lesbian and Gay Film Festival, The Stadtkino in Vienna, the Pacific Cinematheque in Vancouver, the National Film Theater in London, the Buenos Aires Festival of Independent Cinema, the New York Gay and Lesbian Film Festival, the First Tokyo Lesbian and Gay Film Festival, the Cork Film Festival in Ireland, the Wellington Film Festival in New Zealand, The Bios Art Center in Athens, Greece, and the Anthology Film Archives in New York. Friedrich is the writer, cinematographer, director and editor of all her films, with the exception of Hide and Seek, which was co-written by Cathy Quinlan and shot by Jim Denault. Her work is screened and distributed widely throughout the US, Canada and Europe. She teaches film & video production at Princeton University. Her DVD collection is distributed by Outcast Films.